Heat a saucepan over medium-high heat and add some sugar. Let caramelize. Add liquid from jarred sour cherries. Dissolve starch in water, then slowly whisk in to the saucepan. Once thickened, add sour cherries. Add egg yolks to a bowl set over a pot of simmering water. Whisk in remaining sugar and Marsala wine. Heat over simmering water, whisking constantly until the mixture is creamy and light. Pour over the sour cherries. 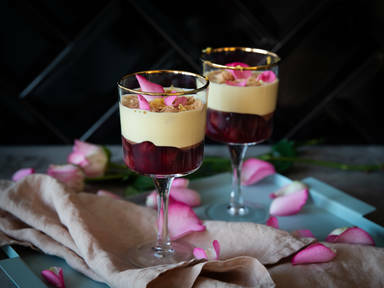 Garnish with amaretti cookies, fresh lemon zest, and rose petals, if desired. Enjoy!